Published: May 25, 2016 at 11:07 a.m.
College Football 24/7's "16 for '16" series continues with a look at 16 offensive players who are on their way to being NFL stars. Naturally, it's loaded with skill-position players, although a pair of offensive tackles made the list. It's also loaded with underclassmen. 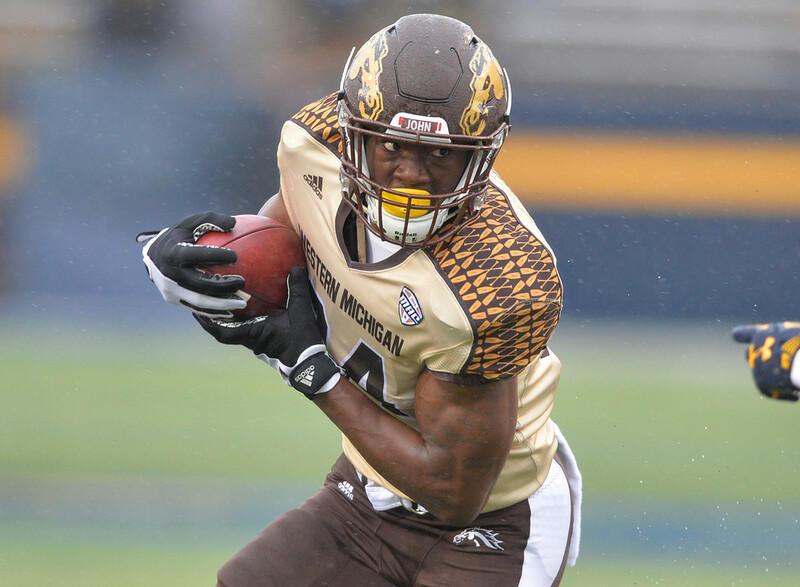 Western Michigan's Corey Davis is the lone senior, and two coming off their freshmen seasons won't be draft-eligible until 2018 at the earliest. Playing in the Mid-American Conference, Davis won't be all over the television this fall, but when football season ends and draft season begins, you'll hear his name more. He's the active FBS career leader in receiving yards (3,785) and has posted back-to-back seasons of 1,400-plus. The NCAA FBS record for career receiving yards is 5,005 (Trevor Insley, Nevada). Given that Davis' quarterback, Zach Terrell, is also back, consider Insley's record in serious jeopardy. As a freshman in 2014, Johnson's talent allowed the FSU coaching staff to move eventual first-round pick Cameron Erving from the all-important left tackle position to center in the middle of a College Football Playoff chase. As a sophomore, he was named the ACC's best blocker as winner of the Jacobs Trophy. He's dominant as a pass protector, and will prove to be excellent security for whichever quarterback the Seminoles ultimately name as a starter this fall. Even though he's only one year into his college career, all that's really left for Ridley is to add some size and strength. He proved his toolbox is otherwise full last year in stepping in for Amari Cooper as the Crimson Tide's No. 1 receiver. In fact, he broke Cooper's school freshman record for single-season receiving yards with 1,045. Ridley won't be draft-eligible until 2018 at the earliest. For all the talk about how big Alabama's RB Derrick Henry was last year, Hurd is about the same size. He's also more proven as a receiver with 57 career catches. Hurd ran for 1,288 yards and 12 touchdowns as a sophomore, and capped it with an Outback Bowl MVP. Volunteers coach Butch Jones has boldly called him the best running back in the country. With Laremy Tunsil's early jump to the pro ranks, Robinson takes over as the undisputed top left tackle in the SEC. He held his own as a freshman against a battery of pass rushers that included Dante Fowler, Myles Garrett, Trey Flowers, Shane Ray and Joey Bosa. Last year he struggled through some nagging injuries but finished the season strong. Whenever he enters the NFL, he'll face questions from NFL teams about his arrest earlier this month. Crimson Tide coach Nick Saban said last week that Alabama was still gathering information on the incident. It's a tribute to Ford that he lost his starting quarterback, Michael Brewer, for a large chunk of last season due to a broken collarbone, and still managed to lead the entire ACC in receiving yards (1,164) and receiving touchdowns (11). Expect a habit of catching the ball against his body rather than extending his hands for catches to be one scouting knock, but Ford's explosiveness is elite. Oregon running backs have found their way into the NFL of late, from Kenjon Barner to LaMichael James to converted WR De'Anthony Thomas. But none has emerged as a star. Freeman could be the one. With a compact build at 5-11, 230 pounds, he's tougher to tackle than his predecessors. Freeman posted 2,184 total yards for the Ducks last season, 1,836 of it on the ground, and should be heavily relied on once again with UO facing turnover at the quarterback position. USC's lineage of NFL wide receiver prospects continues with Smith-Schuster, who played his best football in USC's biggest games last year, going over 100 yards against Stanford, Notre Dame and Utah among others. You want toughness? He broke his right hand against Cal on Oct. 31, underwent surgery and caught eight passes for 138 yards the next week against Arizona. Even with a new quarterback to work with this fall, Smith-Schuster should vie with Washington State's Gabe Marks as the most productive receiver in the Pac-12. It's been 13 years since the Hurricanes had a quarterback drafted (2003, Ken Dorsey, seventh round to 49ers). Be it next year or the year after, Kaaya figures to snap that drought. Between his freshman and sophomore seasons, he lost the core of his offensive support to the NFL draft (WR Phillip Dorsett, OT Ereck Flowers, RB Duke Johnson, TE Clive Walford), yet still delivered big production in their absence last year. An ACC coach recently called Kaaya the "model NFL quarterback." Perine wasted no time establishing himself as one of college football's elite rushers. As a freshman in 2014, he broke the NCAA single-game rushing record with 427 yards against Kansas. The powerful All-Big 12 star, also an outstanding student, could now be entering his final college season. First things first, however: he missed spring drills recovering from ankle surgery, and his return to full speed this fall is paramount for both he and the Sooners. Back from a frightening neck injury suffered on a touchdown catch in Clemson's 2015 season-opener against Wofford, Williams returns as one of the elite receivers in the game. With imposing size and soft hands, he pulled in 1,030 yards as a sophomore in 2013, yet did it on just 57 catches for a hefty 18.1-yard average. His position coach, Jeff Scott, believes he could have been a first-round pick in 2016 without the injury. The son of former Denver Broncos WR Ed McCaffrey enters the season as a strong Heisman Trophy candidate and the most productive returning offensive player in college football. With NFL draftees Joshua Garnett and Kyle Murphy exiting the Stanford offensive line, don't expect McCaffrey to crack the 2,000-yard rushing mark for the second year in a row. Still, with the speed to score from anywhere on the field, McCaffrey's all-around skills as a receiver and return man will have NFL scouts highly intrigued. The Bruins' star took the Pac-12 by storm as a freshman last year, passing for 3,688 yards and, more impressively, setting a school record with 245 consecutive pass attempts without an interception. Coach Jim Mora believes he would have been the No. 1 overall pick in the draft this year, and NFL Media analyst Daniel Jeremiah has called him the most gifted quarterback in the college game. At the earliest, Rosen will be draft-eligible in 2018. When Jameis Winston struggled with interceptions and inconsistency in 2014, it was Cook who helped carry the Seminoles' offense through some of its toughest games. Just a freshman at the time, he became the centerpiece of the offense as a sophomore with 1,691 yards and 19 touchdowns. He doesn't have the raw power of a Leonard Fournette or a Jalen Hurd, but his combination of vision and quick feet is second to none and a thing of beauty. For the best glimpse into Watson's promise as a quarterback, consider his torching of Alabama in the CFP title game as Exhibit A. Against a defense loaded with draft-worthy talent, he was unstoppable (405 passing yards, four TDs, 73 rushing yards). An NFL quarterbacks coach took notice, and suggested he could be a No. 1 overall choice in 2017, if he enters the draft as an underclassman. What else needs to be said about the pro potential of the Tigers' star rusher? Fournette recorded 10 100-yard games last year with four over 200, and NFL Media senior analyst Gil Brandt has said he has the look of a No. 1 overall pick.